This photo of the Red-spotted Newt, Notophthalmus viridescens viridescens, was taken in the Leatherwood Ford area of The Big South Fork NRRA in North Central Tennessee. One of four subspecies of the Eastern Newt. The others are broken-striped, Central, and Peninsula. Range: Eastern Newt throughout most of the eastern US. Red-spotted (shown) much of the mountainous east. Length: adults up to 5.5"
The Red-spotted Newt has three distinct life stages; aquatic larvae, terrestrial adult (red eft), aquatic adult (newt). 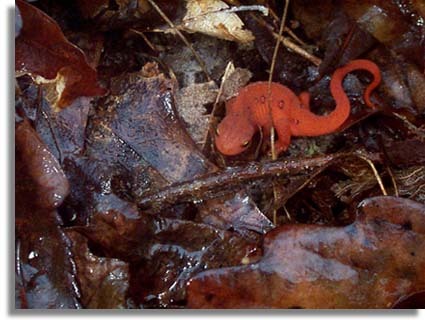 The Newt in the photo is in the red eft stage a stage in which they can often be seen crawling the forest floor after a rain. The eft stage can last 2 years before they return to the water for their adult stage. Adults are olive green with a yellow belly.